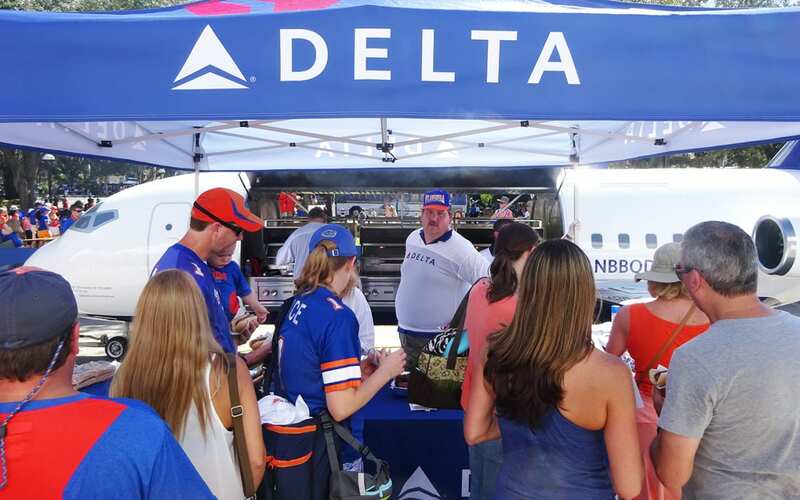 Delta Air Lines has landed at five universities this fall with its Delta Celebration Grill, where it is cooking up burgers, handing out branded premiums, offering social media photo sharing ops and adding members to its SkyMiles loyalty program. The aviation-themed grill is the handiwork of more than 60 Delta TechOps employees from seven departments who designed, engineered, fabricated and painted the structure, which looks like an actual plane and can crank out 500 burgers an hour on six grills. Its wingspan measures more than 20 feet, and the fuselage grilling chamber is 38 feet long and nearly 15 feet high at the tip of its tail. Its tail and wings collapse for easy transport, and the grill arrives on campus in a custom 48-foot trailer. Stops include Penn State, Notre Dame, the University of Florida, Ohio State and Michigan State. Besides the grill, the Sky 360 Tailgate footprint offers a lounge space with furniture and flat-screen TVs showcasing college game day or ongoing games and a digital/social photo sharing activation where fans can have their photo superimposed on the field, with a mascot or in front of a school landmark. At select schools, football alumni legends, such as the Ohio Buckeyes’ Bobby Carpenter and Anthony Schlegel, appear for fan engagement and autograph signings. The grill is one more way that Delta is ramping up its college sponsorship program. 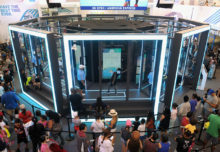 “I think what is important about the program is that we have these various touchpoints, whether it is move-in day at Michigan State, Midnight Madness events at Duke, or tailgates at football games with this amazing plane,” says Annika Schmitz, director of sponsorships and brand activation at Delta Air Lines. “The grill is a huge piece of pride that we are happy to bring to these campuses, too.” Agency: Octagon, Norwalk, CT.